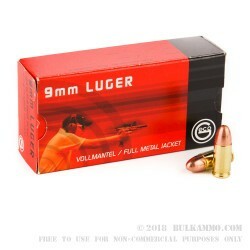 GECO 9mm ammunition is perfect for a high-volume day at the range with your buddies, target practice with your carry weapon or plinking in the backcountry. 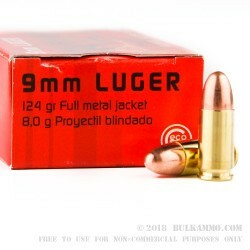 These 9mm rounds are equipped with 124-grain full metal jacket projectile loaded into boxer-primed, noncorrosive, reloadable brass case. Capable of a muzzle velocity of 1181 FPS, GECO’s 9mm target rounds provide constant feeding, ignition and extraction—with reliable accuracy. 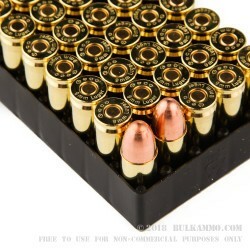 Each box of GECO 9mm 124-grain FMJ comes with 50 rounds. With over a century of experience in ammunition manufacturing, GECO is a name trusted by hunters and target shooters worldwide. Made in Germany, GECO prides itself on producing high-quality, premium target ammunition at a price that keeps you shooting. Q: does jacket contain any steel? A: Hello Mike, These 124gr. 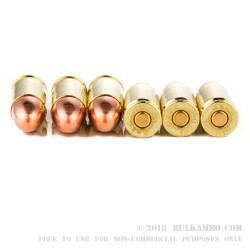 FMJ rounds by GECO in 9mm have a brass case, lead core, and copper jacket. They do not contain any steel and are safe to shoot on ranges that do not allow magnetic rounds.